I thought it about time that I started to interpret some of the shopping list data on a wider scale rather than looking at the individual lists. 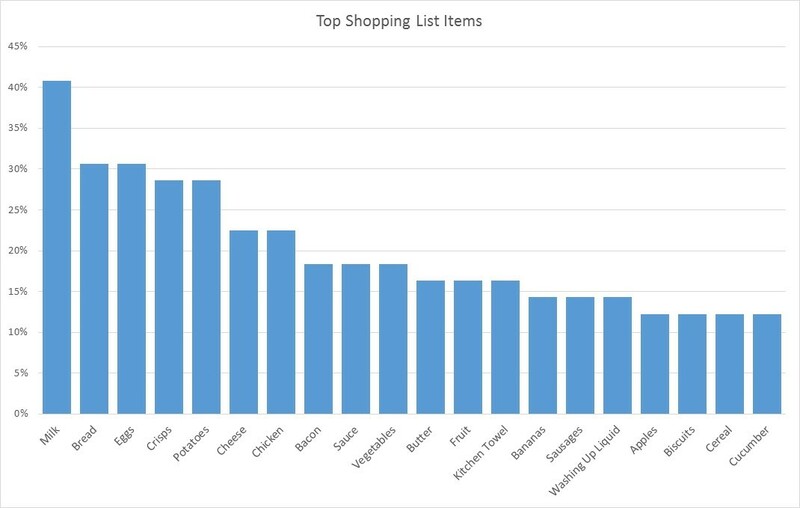 Below is a graph showing the top shopping list items by percentage of lists that they appear in. The staples of milk, bread, potatoes and eggs appear popular but the surprise entry in the top 5 is crisps (potato chips). Fruit and vegetables are placed at position 10 and 12. I would assume people always buy these and don’t always spend the time listing them. Meats by popularity are chicken, bacon and sausages. Beef, Lamb and other meets do feature but they are further down the list. 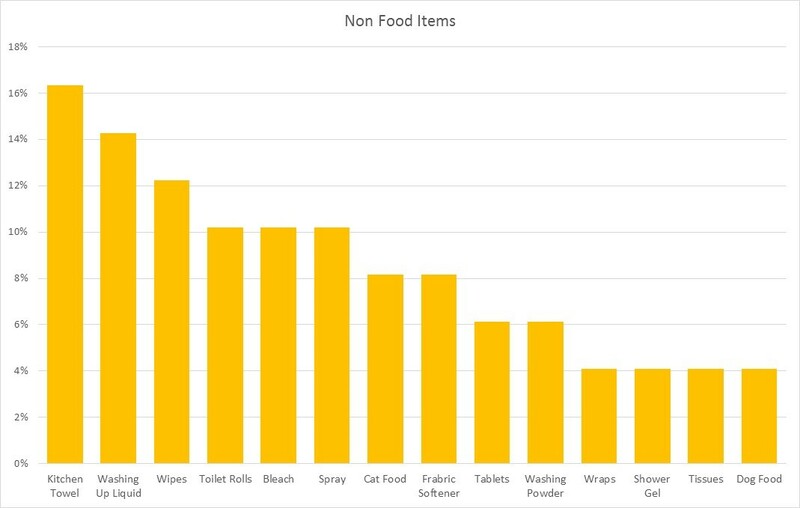 Kitchen towel/roll is popular appearing on over 16% of all lists. Washing up liquid has its rightful place as do toilet rolls. What ‘wipes’ entails I guess is more ambiguous but they are certainly popular. The data suggest that cats are more popular than dogs – or they eat more. Click on the graphs for larger versions. Comments, as ever, are welcome. Your blog is taking over your (and my) life!!! What a great analysis. Your blog is so addictive that I can’t wait to find some shopping lists. Things that surprised me on the charts – Yeah, crisps? How high up on the list is paper towels and washing up liquid – what are we doing? Wraps I assumed where the bread wraps that Brits use more of these days in place of slice sandwich bread, as tortillas or as chapattis? What other type of non-food wraps are there? Or should that be wipes?